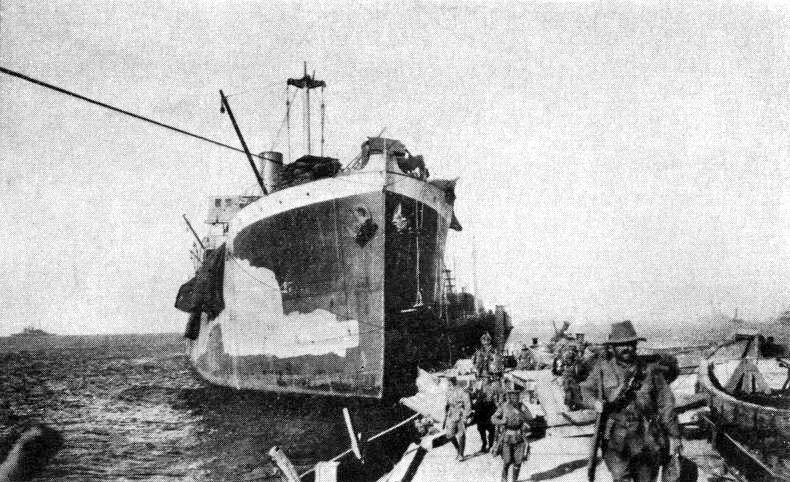 The 1st Battalion Royal Dublin Fusiliers, along with the Munster Fusiliers and the Royal Hampshire Regiment, landed at V Beach off a steam collier called the SS River Clyde. Sides had been cut out of the Clyde and the landing plan was for the Clyde to be beached and that the 2000 men inside her would run down wooden gangways onto pontoons that had been dragged near the shore alongside the ship. From the pontoons the men would jump onto the beach and advance inland to fight the Turks. Machine gun fire would cover the men coming ashore. But it all went wrong. The German commander advising with the Turks, General Von Sanders, knew that Cape Helles was a vitally important part of the peninsula to defend so he had heavily defended it with barbed wire under the water, and along the ridge he placed more wire and machine-gun placements. The Dubs, Munsters and Hampshires did not stand a chance. 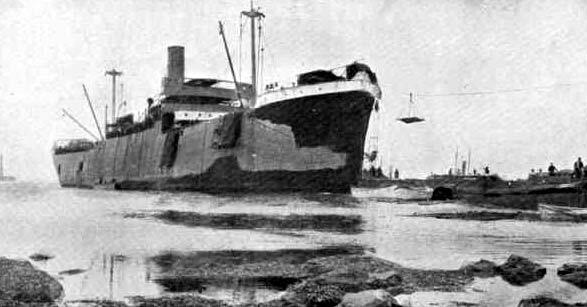 The Clyde beached 80 yards out. The Turks machine guns opened up. Many men sank owing to the weight of their equipment and were drowned. The carnage on 'V' Beach was chilling, dead and wounded lay at the waters edge tinted crimson from their blood. Three attempts were made to get ashore by companies of the Munsters and The Hampshire Regiment but all ended in costly failure. Further attempts to land were abandoned and the surviving soldiers waited until nightfall before trying again. The efforts of sailors to maintain the bridge from the ship to the beach, and to recover the wounded, were rewarded by six Victoria Crosses. The recipients were Commander Unwin (aged 51), Midshipmen George Drewry (20) and Wilfred Malleson (18), Able Seaman William Williams (34), Seaman George Samson (26) and Sub-Lieutenant Arthur Tisdall (24) from the Royal Naval Division (RND). Of these men, only Williams died during the landing. Samson was severely wounded to following day. On his return to Scotland he was handed a white feather while wearing civilian clothes. Tisdall was killed on May 6 when the 6th (Hood) Battalion of the RND, made its advance along Kanli Dere during the Second Battle of Krithia. Malleson, who died in 1975, served on the battleship HMS Cornwallis. River Clyde remained beached as a dock and breakwater. Her condensers were used to provide fresh water and a field dressing station was established in the hull. She remained a constant target for Turkish gunners on the Asian shore. By 1919 the upper works of the ship had pretty well all been stripped away; including the wheelhouse, bridge etc. She also had large shell holes all over the place, including on the poop where the head of the rudder stock and the stearing gear had once been. She was pulled off 'V' Beach and towed to Mudros where temporary repairs were effected which allowed her to be towed by a trawler to Malta. For this voyage she had a volunteer crew of about 20 RN ratings and they reached the Malta dockyard in July 1919. "Seaman A Pearlman, one of the Royal Naval running crew of about twenty, wrote of how he volunteered for the job, having been told that it had its dangers but in a calm sea should be safe enough. He described how runners drew rations and clambered on board the River Clyde where there was 'not a rope, hawser, chain or rail'. For safety's sake they sat together in the middle of the deck, away from the shell holes, as there seemed to be no habitable part of the ship's interior. They tried to have a sing-song as darkness fell but the sea got up and some were sea-sick. 'It was' he wrote, 'as much as we could do to sit together without falling off the deck.' The only light they had came from the matches with which they lit their cigarettes. Trawler and tow put into Skyros for the night and the crew sat it out in the darkness. Eventually she reached Malta without mishap"
The Times of January 20th, 1920 reported that she had been sold to Harris & Dixon for GBP 11,500. H & D were brokers acting on behalf of 'a Spanish account.' Questions were asked in Parliament in March and again in May, but to no avail; the cost to the nation would have been too great and she could not be saved. As a tramp steamer, she was operated by Spanish shipping companies for another 50 years in the Mediterranean under various names, the last being Maruja y Aurora (Mary and Aurora) between Barcelona and Castellon, apparently still bearing pockmarks.